HomeVale GMH Elizabeth. 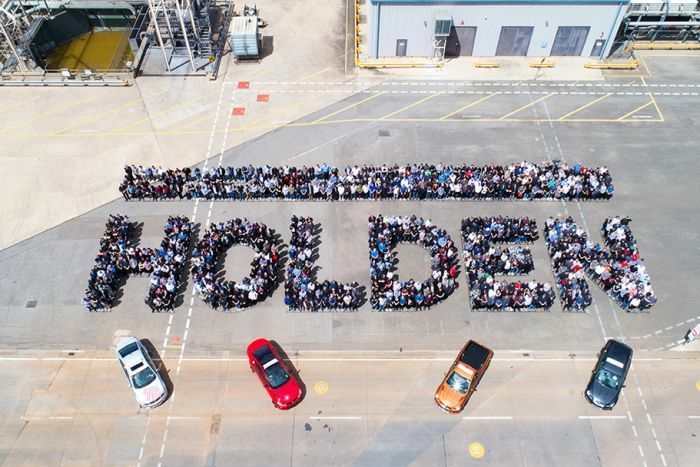 Holden, You Served Australia Well. Cocaine, gambling and prostitution are rife within top-level rugby league circles, a long-running investigation by the NSW Organised Crime Squad has found. 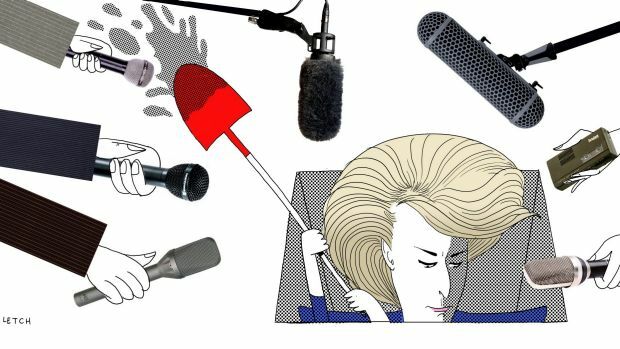 Kate McClymont goes into detail. The fate of the deputy prime minister, Barnaby Joyce, will be determined today by the high court in a decision that could end the terms of three senior Turnbull government figures, or lift doubt on their status and provide a major boost for its political fortunes. Coal use will have to be “pretty much” gone by mid-century if the planet is to avoid sea-level rise of more than a metre by 2100 as Antarctic ice sheets disintegrate faster than expected, new modelling by an Australian-led team has found. 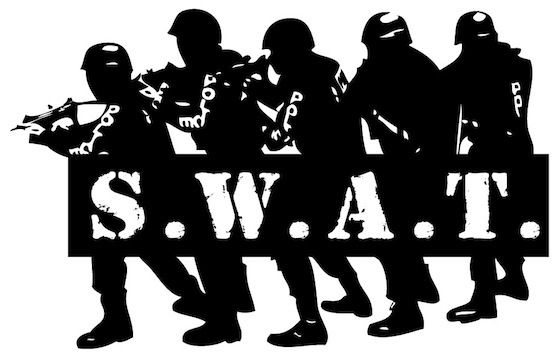 Any more of this they can expect an AFP raid! Few seem as excited about the release of the final batch of secret documents from the 1963 assassination of John F. Kennedy as the current occupant of the Oval Office. James Packer has conceded his ambition of expanding Crown Resorts into an international casino and hotel empire has failed. Twenty reasons why the Turnbull government is gutting the ABS. The Coalition government is ramping up its controversial “robo-debt” program, sending letters to welfare recipients about Centrelink debts in greater volumes and ignoring repeated calls to halt automated debt recovery. Forget Brexit, here is the single most important decision for the world economy. The SMH editorialises about protections for renters. The terrible human cost of WA’s FIFO economy. The federal government is likely to have bought “ghost water” for environmental flows into the Darling when it paid $78m in June for water entitlements in the Lower Darling – more than twice the sum recommended by its own official valuation. That would be Barnaby’s work wouldn’t it? The Rineharts continue to play “happy families”. There has been quite o lot of social disturbance resulting from WestConnex works. Residents have been sent earplugs! David Rowe goes for the jugular. 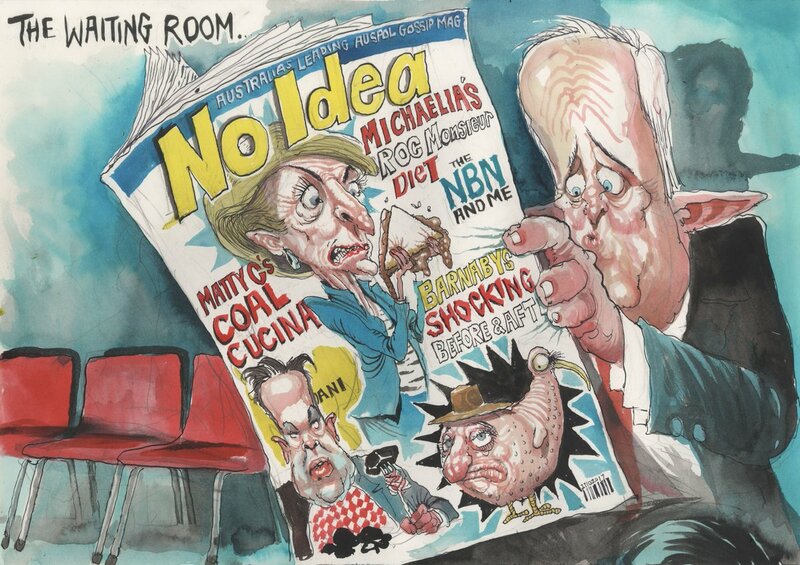 Have a look at this effort from David Pope! 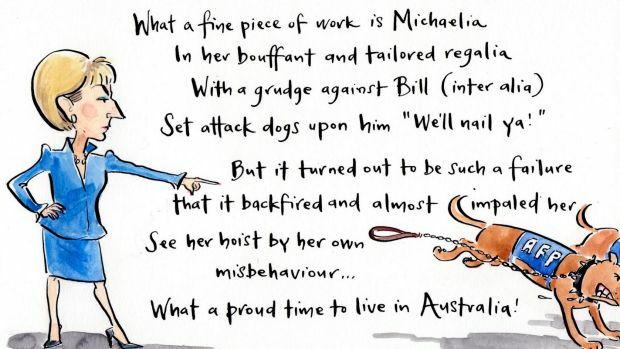 Cathy Wilcox bursts into poetry over Cash. Andrew Dyson’s not buying the denials. Simon Letch with Cash at Estimates. Mark Knight and the cash donation to Labor. 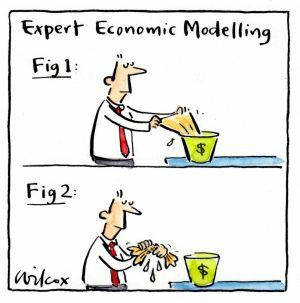 Matt Golding and trickle-down, Liberal style. 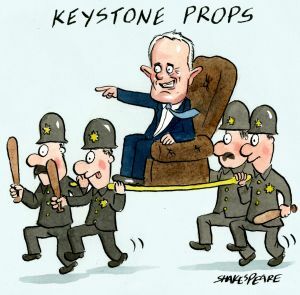 John Shakespeare introduces the Kesytone Props. 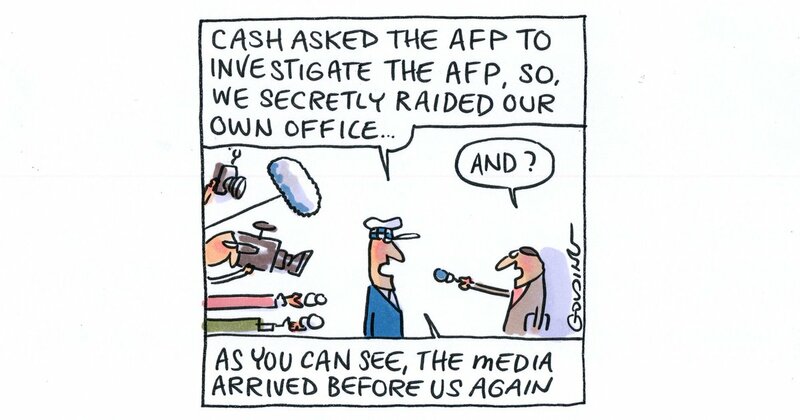 More from the prolific Golding as the AFP raids itself. Paul Zanetti toes the Murdoch line here. 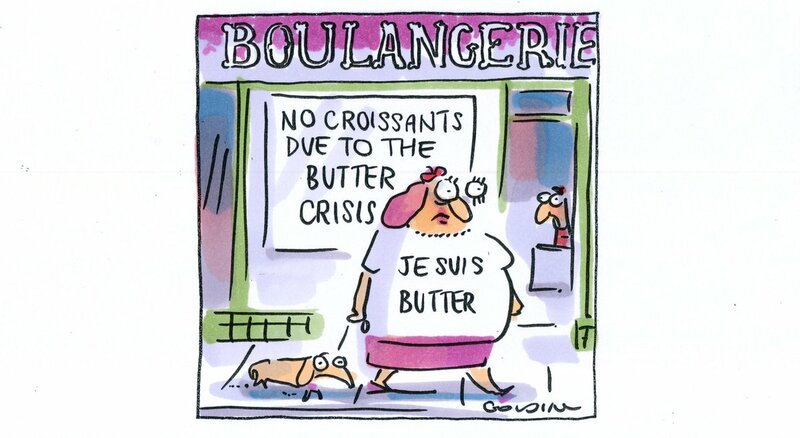 Golding and the butter crisis hurting Parisians. Sections 1 to 3 are in the gut of WordPress. Has our government being trying to find finace for Adani? 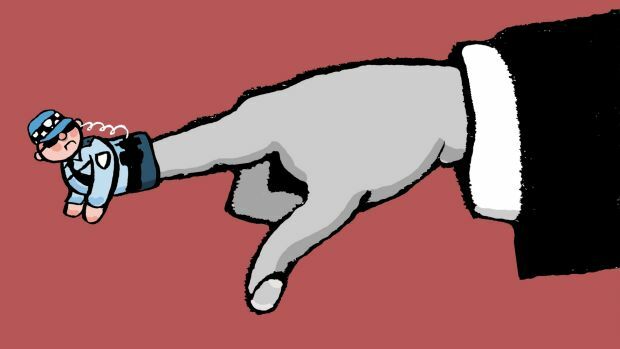 Key federal crossbenchers have questioned senior government bureaucrats about possible secret approaches to foreign agencies for financial support for Adani’s controversial Carmichael coal mine. The questions have been sparked by a Freedom of Information request to the Department of Foreign Affairs and Trade (DFAT) for documents relating to requests for foreign government financing for the controversial multi-billion-dollar mine and rail project. In other mining news – I’m not sure about Adani being a ‘success’, but that’s News Corp for you. Why is Rockhampton Regional Council so keen on whopping huge coal mines when no-one wants coal any more? As a long time lurker and first time poster,Labor shouldn’t let this die. Hammer the lying mongrel bred bastards from this day until the election and keep hammering them after the election. First thing to do when Labor win government, launch Royal Commision’s into every dodgy piece of legislation and every dodgy deal they have made and throw them in jail, and get a Federal ICAC set up and running. Give it real teeth. Probably get a few from your own side of politics but so what? Nail all the bastards to the wall. Barry, a hearty welcome to you! My apologies for not spotting your comment earlier. Now that you are “approved” you shouldn’t have any more problems posting here. Welcome Barry, from another long time lurker and occasional poster. Hello Barry, and welcome. I agree with you 110%. Exactly Barry. It’s too big to let slide. And welcome to The Pub. I don’t post as much as usual due to convalescence from lymphoma (now thankfully in remission) but continue to read and use this blog to stir up a bit at Twitter. More Cash corruption reveled at Senate estimates – and there it is again, the ‘E’ word. Turnbull is sticking up for Cash, saying she acted ‘entirely appropriately”. After reading that all I can think of is Godwin Grech and Uetgate. You’d think Turnbull might have learned something from that experience, but it seems not. I just don’t understand Turnbull at all. His decision to scrap an indigenous voice in parliament is not going down well. Turnbull could have redeemed himself a bit by going ahead with this idea. 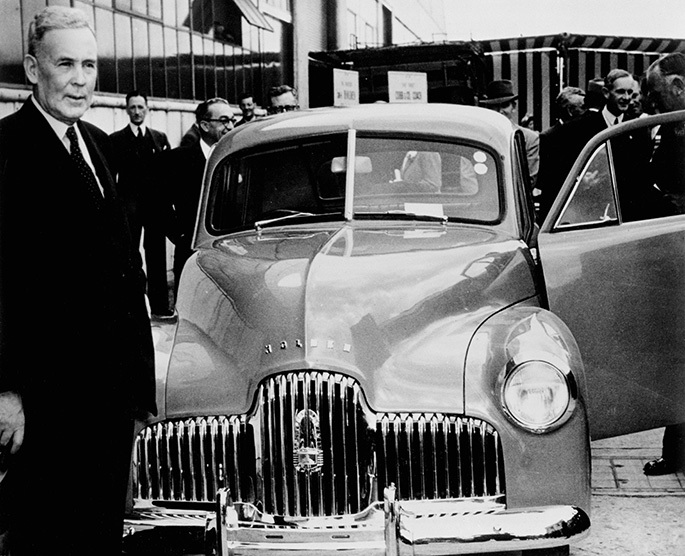 Keating gave us the Redfern speech, Rudd gave us the apology, Turnbull could have continued reparations by pushing ahead with implementing the Uluru Statement proposals and ensuring he left one decent thing as his political legacy, but he chose not to do that. Even worse, he chose the 30th anniversary of Uluru being handed back ti=o its traditional owners as the day to make his announcement. Instead he opted for what Noel Pearson (finally learning toadying to Coalition governments gets you nothing but kicks in the guts and broken hearts) has described as ‘egregious dogwhistling’. Patrick Dodson says the decisiobn was “not honourable” because Turnbull and Scullion had not consulted with their government’s own Indigenous Advisory Council. It could have been so very different. We could have had headlines praising Turnbull. Turnbull could have had an antidote to CashGate. He just let all that go. Instead he gets headlines accusing him and his government of an act of mean-spirited bastardry. Everything he does is a disaster, he makes no effort to even try to turn things around. It’s as if he not only wants to lose the next election but intends to lose by a record number of votes. This is what Brandis is relying on to say he (and the ROC) can’t answer any questions on the raid. Redact who it’s from and who it’s to, then leave the full name and title at the bottom. If Brandis and/or his staff ever attempted a burglary they’d leave calling cards with their names and addresses behind and then wonder how the coppers found them within minutes. Welcome. We don’t bite here so please comment more often. No one has ever laughed at me with my silly stuff, so you’re pretty safe. I’d love for Labor to go for the throat, but I love the way Bill Shorten is handling the whole thing. He is coming across to me as a safe and steady hand on the tiller. It took a while for me to come around to appreciating him, but I now admire him. My beef is with the msm who(m) are just ignoring him, and sometimes when I have a look at twitter I do catch a few of his door stops, which he is very good at. His polling is neither here nor there, but if more people got to see him and hear him I’m sure that would change. 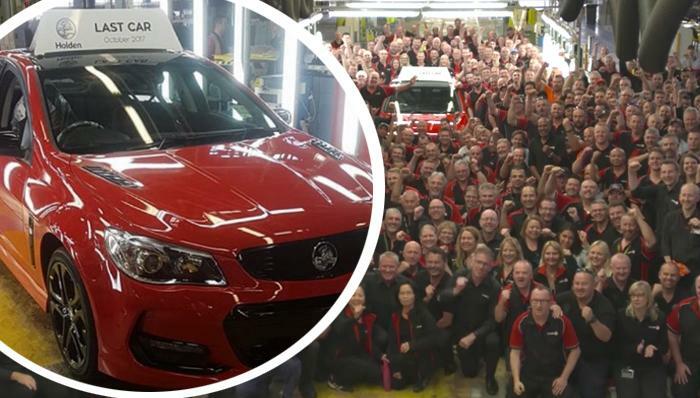 The Australian Federal Police have launched an investigation into the leaking of information about the raids on the Australian Workers Union headquarters this week. Attorney-General George Brandis has said the government and representatives of the Registered Organisations Commission will no longer answer questions on the matter while the police probe is ongoing. Cashgate is a comedy of errors. 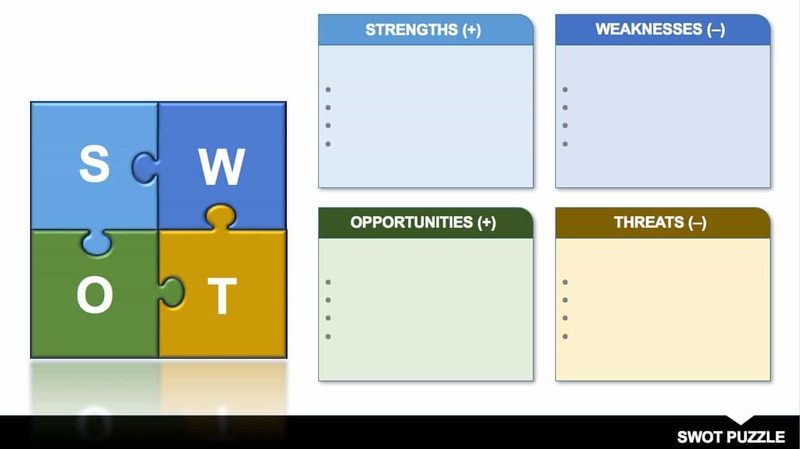 Do they ever do that whiteboard SWOT exercise with these things, as opposed to SWAT of anything the do not like. We are now in a Constitutional crisis. I’m guessing he will resign altogether over private matters. Another where were you moment! Whoa. Was NOT expecting this result. I thought Canavan was a goner for sure because of an earlier story from the Italian consulate that one can only apply for their own citizenship in person. I find it pretty suss that he was cleared. But wow. This result is at least probably the next best thing. Roberts can hopefully disappear from politics for good, and Turnbull can have lots of “fun” over the next few weeks sorting out the new cabinet. A by-election when 46-54 behind… this is going to be delicious. Sam Maiden says she has heard talk Turnbull will prorogue parliament until after the New England by-election, to prevent Labor taking over the parliament. It’s only gossip – so far. So much for “the High Court will so hold”. That might be Turnbull’s political epitaph. Re the Cash saga. What Brandis, with all his chicanery, doesn’t seem to understand is that it’s not the issue of whether Cash retains her position that’s at stake here. It’s the credibility of the Turnbull government. They drag their reputation further and further down the longer they drag this out and quash proper scrutiny into it. They’ve already buggered up the chance they were seeking to hammer unions and Shorten, that’s long gone. 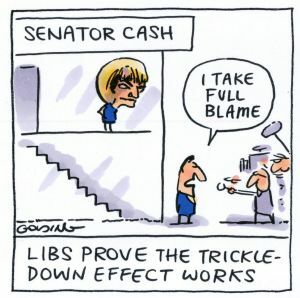 Now the spotlight’s turned back onto them they’d be best advised to move Cash on as quickly as possible, because if she stays she’s going to have the same effect on the party as Ley and Bronwyn Bishop did – and Hockey for that matter. A constant reminder that they hit below the belt and bend the rules to suit themselves. They can’t win any elections while the stain remains on the party. Simple as that. There’s no advantage to be gained in protecting Cash. Their major worry is the possibility – still alive – that Turnbull could be dragged into it. They’d want to close that avenue off by cutting Cash free. Big win for former Solicitor-General Justin Gleeson and the rest of Tony Windsor’s legal team, big slap-down for Brandis and the ‘expert’ advice of his choice of SG. Barnaby was never going to retire. He will win the by-election, messy personal problems don’t put off National voters. Neither does being absolutely useless. My gut feeling – this by-election will probably result in a range from 52-48 to Joyce to 51-49 to Windsor. It will be close and bitter, but, the government is roughly 4-5% less popular than it was last year, and then there’s the SFF and One Nation running rampant in country NSW that can leak preferences. I’m also curious to see if Labor will put up a candidate, that may be a big factor as well if it’s a contest between Joyce and Windsor. Hanson & Roberts presser at 2. If Baaanaby is deemed to be ineligible, why isn’t the person that came second in the seat of New England declared the new member? Why a bi-election? Because the whole election was made invalid by Barnaby being ineligible. I’m thinking Malcolm Roberts will stay on. His citizenship problem has been fixed, he’s now eligible to fill the casual vacancy he himself has caused, so don’t be surprised if Hanson announces he’ll be back ASAP. Actually that can’t happen. Roberts was invalidly elected in the first place, so it can’t proceed to a casual vacancy. It’s a recount, where no.3 on One Nation’s ballot would be elected. And it’d be up to him if he wants to resign his spot or not for Roberts to return via casual vacancy. If he doesn’t, I expect Hanson would throw a hissy fit as usual and expel him from the party, but he’d still sit as an Independent senator until his term expires in 2019. Hanson’s talking now, she says she’s devastated at losing Roberts, but she seems to have no idea about what the recount will mean. She’s talking about not knowing if it’s a total recount or not, whatever that means. We might get a word from Acting PM Bananas. Well, you know, he always displays great dignity at these moments. Who can forget his gracious speech on election night? 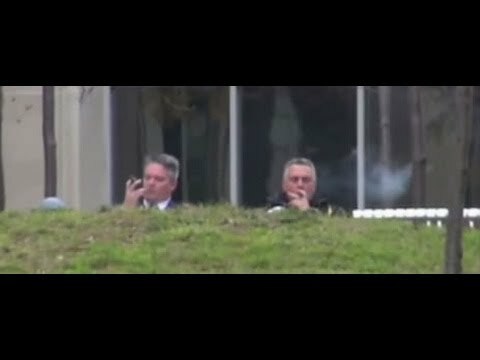 Was there any validity in the ALP claims that every Parliament vote Joyce participated in while he was there is now illegitimate? I assume that’s technically correct but for all practical purposes unenforceable. Writs to the High Court on that would be QI. After this judgement, how can we ever have any faith in the sagacity of anything legal from Bookcase? I’m not sure he even is our Prime Minister any more, is he? He’s now the leader of a party that can’t form a majority on the floor. Technically it’s a hung parliament, so he needs the support of enough indies to guarantee supply and confidence. He had that, but there might now be some indies rethinking their support. Roberts is standing for Qld parly. The numbers as they are on the floor is essentially 74-74 with the Speaker’s casting vote, so the government still has a “functioning” majority, by the barest amounts. Yes it’s “convention” for the speaker to be impartial but we all know that Smith will vote along party lines on everything. And even then, Cathy McGowan’s said that she won’t vote against Turnbull in a no-confidence motion. I suppose it’s better her than Mirabella being there but politically there’s probably no difference.